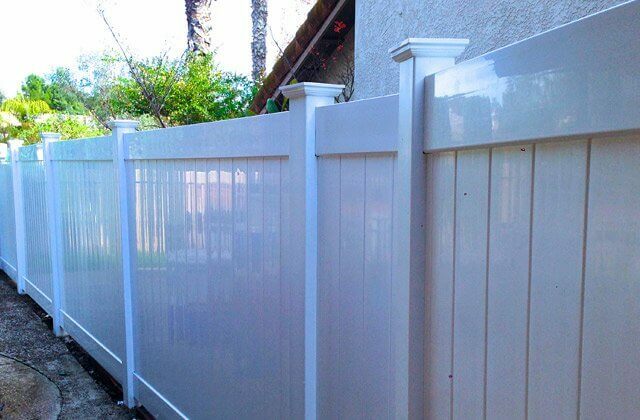 J&J Vinyl Fence is Torrance's best value for fencing: We offer high-quality custom vinyl and aluminum fences and gates backed by lifetime warranties at cost-competitive prices. 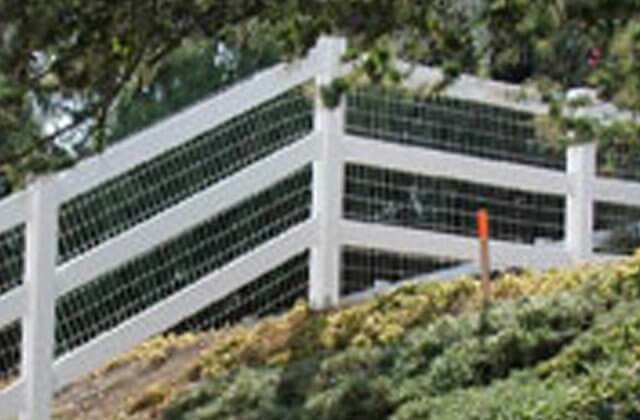 For the last 35 years, our skilled craftsmen have installed beautifully crafted fences and gates for thousands of residential and commercial property owners across Los Angeles County. And, because we value complete customer satisfaction, we provide our low-maintenance vinyl and aluminum fencing solutions in a time-efficient manner that always meet budget requirements. To maintain our high standards, every project is closely supervised either by our owner or one of our other highly trained and experienced professionals. Contact Torrance's preferred vinyl and aluminum fencing contractor for a free on-site consultation. 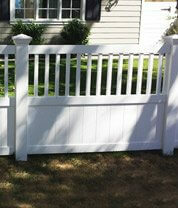 J&J Vinyl Fence accepts all major credit cards and checks, and we provide a 10% discount to first time clients. As a licensed, bonded, and insured company, you can depend upon the quality of our service. Our hours of operation are Monday through Friday from 7:00 a.m. to 5 p.m. and Saturdays and Sundays by appointment only. Call one of our knowledgeable fencing experts today! If you desire fencing in Torrance that distinguishes your property, but doesn't require complete privacy, then vinyl semi-privacy fencing is the best choice for you. Our vinyl semi-privacy fencing provides increased airflow, openness, and diversity in design. We offer an array of attractive color, cap, and accent options, from lattice-tops and open boards, to arbors and trellises. 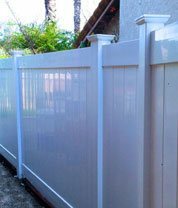 At J&J Vinyl Fence, we have remained wholly dedicated to excellent service and premium quality craftsmanship when it comes to our customized vinyl semi-privacy fencing. Over the last 35 years, we have built a solid reputation throughout our Torrance service area for providing the most beautiful and economical vinyl semi-privacy fences around. We work one-on-one with our clients through each step of the process to ensure all components of your fence fully reflects your design and security preferences. As a testament to our dedication to complete client satisfaction, we pledge to provide competitively priced, comprehensive vinyl semi-privacy fencing solutions with quick turnaround. Additionally, we only use vinyl that's produced by manufacturers who provide lifetime warranties. Trust in our licensed, bonded, and insured company today and call for a free estimate. New clients will receive a 10% discount off our already affordable services. At J&J Vinyl Fence, we fabricate custom vinyl privacy fencing from materials produced by the highly regarded manufacturer ActiveYards®. ActiveYards® is unique in that its vinyl products use GlideLock™ technology, a cutting-edge feature that securely connects each piece of your privacy fence together more tightly than the average wooden fence. With ActiveYard®'s GlideLock™ technology, you are getting a structurally-sound fence that blocks airflow and wind, creating a private, enjoyable space for added comfort and protection. In addition, these lifetime warrantied vinyl privacy fences will never rot, peel, chip, fade, or blister. We build them to perfection to appear like wood, without any of the tedious maintenance concerns. Begin working with the fencing professionals at J&J Vinyl Fence today. Our licensed, bonded, and insured business provides free on-site consultations and 10% discounts off our services to new clients. At J&J Vinyl Fence, we provide our Torrance clients with cost-effective, high quality vinyl ranch rail fencing to secure and beautify any commercial or residential property. As specialists in the fencing industry for over 35 years, we are able to expertly customize any variety of vinyl ranch rail fence. Vinyl ranch rail fencing is an excellent fencing option for those clients who prefer the appearance of traditional wood fencing, but do not want the maintenance requirements. In contrast to wood, vinyl ranch rail fencing won't require replacements for rotting boards, and it won't crack, peel, warp, or blister due to sun damage. This makes it the perfect fencing option for those looking for a long-term investment. Our customized vinyl ranch rail is ideal for safely enclosing livestock within farms, ranches, or fields, and also well-suited for designating parking lots, businesses, and residences. 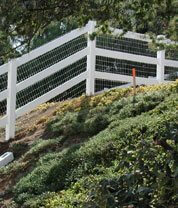 We construct vinyl ranch rail fences using two, three, or four rails across. We also offer vinyl ranch rail in crossbuck railing, a beautiful complement to any city park, golf course, or countryside estate in Torrance. We are licensed, bonded, and insured, and stand behind our fencing solutions with lifetime manufacturer issued warranties. Call J&J Vinyl Fence today for your free vinyl ranch rail fence estimate, and receive a 10% discount as a first-time customer. 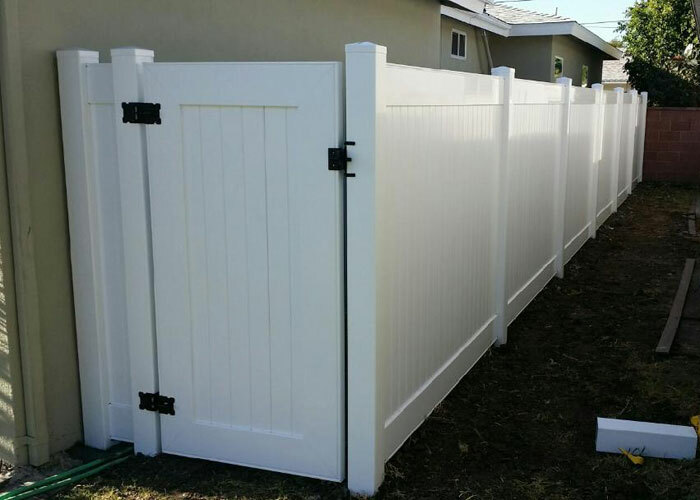 The seasoned fencing professionals at J&J Vinyl Fence have expertly installed beautiful, durable vinyl picket fencing for Torrance homes and businesses for over 35 years. Our custom vinyl picket fencing evokes warmth and timelessness, and can be designed to match any gate or end-cap design. 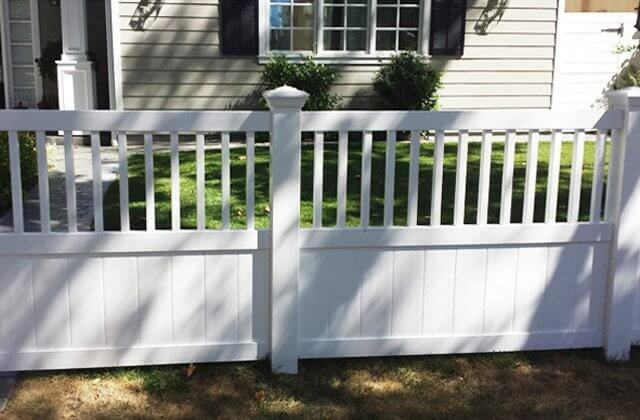 Whether you'd like traditional, contemporary, scalloped, or non-scalloped picketing, we will build your vinyl picket fence based on the exact functionality and architecture desired. They can be painted in your choice of white, tan, or wood-grain finishes. In contrast to wood picket fences, vinyl picket fences maintain their vibrant color and durable structure for decades without ever rotting, flaking, peeling, fading, or warping. 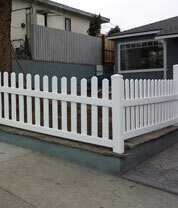 This makes vinyl picket fencing an excellent fencing investment for Torrance home and business property owners. We fabricate our vinyl fences from materials produced by reliable manufacturers who stand behind their products with lifetime warranties. 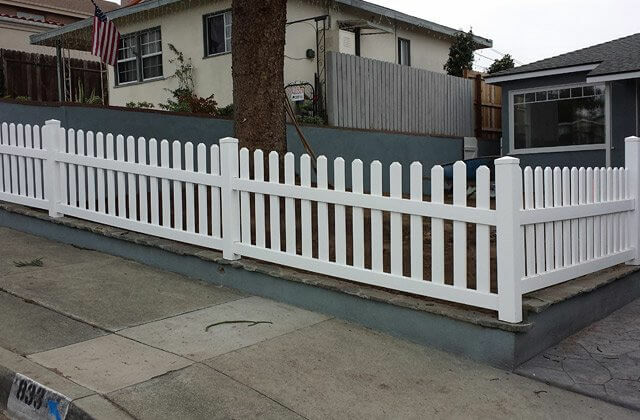 Our licensed, bonded, and insured company is dedicated to providing gorgeous, long-lasting vinyl picket fences that always meet budget and time constraints. Call us today for a free on-site estimate. First time customers will receive a 10% discount off our services. At J&J Vinyl Fence, we create structurally-sound vinyl gates for commercial and residential properties that protect entry and access and match with the corresponding fencing. 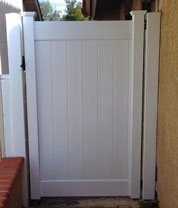 We use our premium vinyl and powder-coated, superior-grade hardware to fashion your vinyl gate, which ensures a gate that functions smoothly and looks beautiful--without any peeling, rusting or cracking--for years. We offer manual and automatic entry gates for pedestrian walkways and driveways. For our automatic vinyl gates, our in-house electrician can install and program a diverse range of state-of-the-art electronic access systems. Whether you'd like an access control system or in-gate operator, your custom vinyl gate can be programmed to connect to any device for remote or proximity-based entrance and exit. We are knowledgeable in Viking Access, DoorKing, Elite Gate, and many others. Call the fencing specialists at J&J today to learn about our free estimates, and receive a 10% discount as a new client. Aluminum fencing is the leading alternative to wrought-iron or steel fencing because it is low maintenance, long-lasting, and cost-effective. Aluminum fencing and gates emulate wrought-iron and steel fencing, but come with none of the upkeep or necessary upgrades, as it is made of a lightweight, corrosion-resistant powder coated aluminum that will never peel, flake, blister, rot, or peel. Its durable properties make it ideal for Torrance homes and businesses that have a pool, are near the ocean, or are exposed to a lot of sunlight. Our customized aluminum fences and gates come with a lifetime warranty issued by trusted manufacturers with whom we have long-standing relationships. Call the specialists at J&J Vinyl Fence today for a free on-site consultation on your aluminum fencing and gate, and receive a 10% discount as a first-time customer. 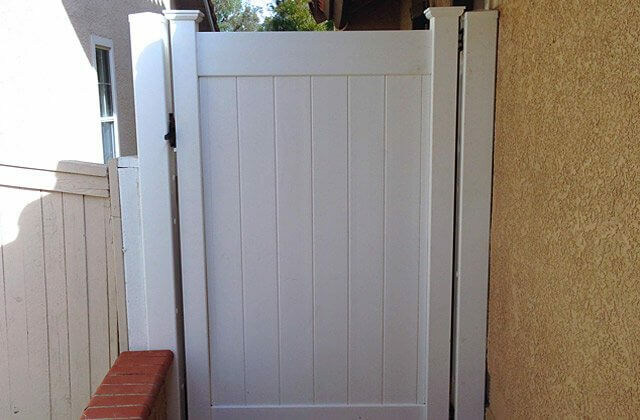 This is a white vinyl privacy fence with a welded privacy pedestrian gate we installed in Torrance, CA.